Regarded as Sri Lanka's very own horseracing derby and the island's own 'Royal Ascot', the Governor's Cup will be held for the 144th year in 2019. This year, which happens to be the running of the 144th year of the Governor’s Cup, was first run in the year 1892 at a distance of 1000 metres. The inaugural Governor's Cup was won by a filly named 'Duchess' owned by Major Hickman, ridden by Jockey Charlie. The first Dead Heat recorded in the Governor’s Cup was in the year 1900 between 'Ludo' and 'Comewell' in a distance of 1400 metres. Incidentally 'Ludo' owned by M/s. Arthur and Payne Gallwey completed the hat-trick winning the prestigious event in year 1898, 1899 and in 1900 ridden by Mr. Payne Gallwey, who as a owner incidentally rode as a 'Gentleman Rider'. The second Dead Heat was recorded in the year 1948 between 'Cosy Corner' and 'Breech' in a distance of 2000 metres. Horseracing was first introduced to Sri Lanka in the 1840’s by Mr. John Baker, the brother of Samuel Baker, with the inaugural race taking place at the Nuwara Eliya Racecourse in 1875. In the 1840s Mr. John Baker created a training course for his imported English thoroughbreds on a hill close to his home. The then Governor of Ceylon, Sir Henry Edward McCallum, inaugurated the prestigious Governor’s Cup and the Queen’s Cup in the early 1900s, through the top two races have been taking place since the inception. 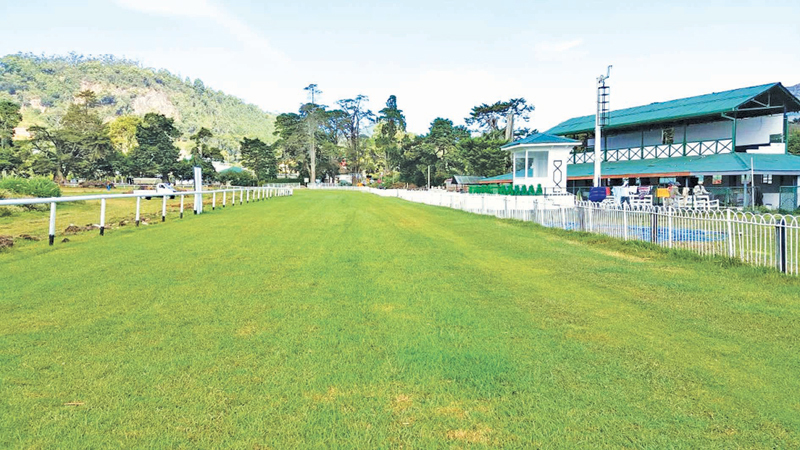 The inaugural race at Nuwara Eliya was held in 1875 and was organised by the Nuwara Eliya Gymkhana Club. These meetings carried on intermittently until 1900 the current racecourse was laid out. In 1910, in a meeting presided over by the Governor of Ceylon, Sir Henry Edward McCallum (1852–1919), it was resolved that the Colombo-based Ceylon Turf Club would be in a better position to manage the Nuwara Eliya course and the race meets, as it had greater financial clout, the ability to offer better prizes and was able to make improvements to the course and its buildings. The upper tiers of the modest but historic grandstand housed the race stewards, members and other assorted VIPs, giving them the best view over the course. Outside of the racing calendar, the town library was located in the ground floor of the grandstand. Horseracing in Sri Lanka peaked in the 1950s. In 1956 horse racing was banned in Sri Lanka, with the historic Colombo Racecourse in Cinnamon Gardens, Colombo together with the Nuwara Eliya course both being shut down. The Colombo Racecourse was subsequently converted into an international rugby venue, and when horseracing returned to Sri Lanka in 1981 the Nuwara Eliya Racecourse became the only surviving race track in the country. Situated 1,868 metres (6,129 ft) above sea level the race course is one of the highest in the world. The track has a circumference of 1,800 metres (5,900 ft) (approx. 9 furlongs) with a 333-metre straight.